For the GlueX experiment we have been evaluating "Silicon Photomultipliers" from SensL. This type of photodetector is immune to magnetic fields and requires only ~30 volts of bias, yet has a gain of 106. 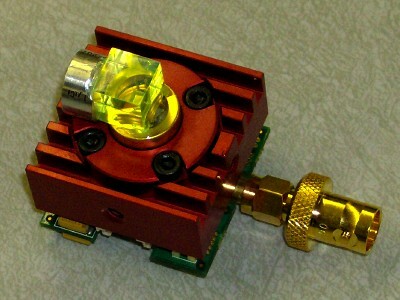 The green cube is Eljen EJ-260 scintillator, the shiny cylinder is an Am241 alpha source, and the 3 x 3 mm active photodetection area can be seen through the top face of the scintillator. The SiPM includes a thermoelectric cooler to reduce its temperature to -20 degrees C.